Silly Bandz® are silicone rubber bands formed into silhouettes of shapes such as letters, numbers, animals, or other objects. They're normally worn as bracelets, and often traded and collected. In all probability collecting and wearing Silly Bandz is a passing fad, like Beanie Babies, Pokémon, and Pet Rocks. Those who invest in them purely for financial gain will probably sustain losses if they remain invested after the peak of popularity. However, engaging in the social interactions stimulated by trading Silly Bandz could have lasting value. By now most of us are aware of business fads, especially in training and management. An idea or method becomes a fad within a particular social group when many in the group adopt it for a time, and then let it go. Fads usually grow rapidly in popularity, and they're often identified as fads only after their popularity peaks. The term fad is usually a term of disdain. Once we identify a fad, we tend to dismiss it. But for ideas and methods, faddishness doesn't necessarily imply absence of value because widespread adoption often indicates real intrinsic value. Because dismissing something just because it's a fad could be a mistake, it's useful to understand the source of value for ideas and methods that become fads. Widespread adoption within a group can give an idea or method the properties of a fad, even if it isn't adopted globally. 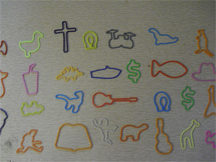 For instance, Silly Bandz® are a fad among the young, but many adults don't even know what Silly Bandz are. We each belong to numerous groups — our own organizations, our industries, cultures, demographic slices, and more. All are capable of fad behavior. If the idea or method confers advantage on adopters, early adopters benefit, but once it achieves fad status, advantages can vanish. For instance, mirroring is a communication technique that helps users build rapport with others. But when the user's communication partner recognizes the use of mirroring, a feeling of being manipulated can result. Early rejecters of a fad can gain advantage, just as early adopters can, if they're among the first to curtail investment when the fad no longer provides advantages. status, advantages can vanishmethod achieves fad status, its use can wane, and people sometimes forget it. Thereafter, new members of the group might never have learned about the fad. If the value of the fad declined as a result of widespread use, its value can then return. Fads that have been passé long enough can confer significant advantages on early re-adopters. Those who adopt an idea or method near its peak of popularity or later might wrongly conclude that it has little value. If the value to adopters arises from being among the minority who use it, and users are the majority, their experience will suggest that it has little value, when in fact, the idea or method might actually be very valuable when users are a minority. Before adopting an idea method, determine the source of its value. Is value inherent, or is value determined by what others do? Would you like to see your comments posted here? rbrenoVdxfWxNOuTnyxFVner@ChacsZMaOhJXwiJWUzXYoCanyon.comSend me your comments by email, or by Web form. I offer email and telephone coaching at both corporate and individual rates. Contact Rick for details at rbrenqJgHSXGtPGHIYSVTner@ChacWWesMzUrFPEyFPGwoCanyon.com or (650) 787-6475, or toll-free in the continental US at (866) 378-5470.